Temple festivals in Kerala are elaborate and exotic. The festivals form part of each temple's annual rituals. They're commonly a tribute to the presiding local god or goddess. Each festival has a different set of legends and myths behind it, depending on the temple deity. However, most revolve around the presence of elephants to honor the deity. The majority of Hindu temples in Kerala own elephants, which are donated by devotees. Kerala's grandest and most well known temple festivals are its poorams, particularly the famous Thrissur Pooram. These festivals are related to one of the 27 stars in Hindu Astrology, called Pooram, and take place according to its auspicious position in certain months. Vela festivals are similar to pooram festivals in terms of scale. They occur at different times though, particularly after the harvest season in March and April. You may also come across gajmela festivals in Kerala. These festivals are large "elephant pageants" with many decorated elephants. While everyday temple rituals are modest in Kerala, the state's temple festivals are a highlight on everyone's social calendars. You can expect swelling crowds, processions of bejeweled elephants, traditional drummers and other musicians, colorful floats with people dressed as gods, and fireworks. The festivals are very noisy affairs. Frenetic percussionists, of which there are plenty, whip up quite a sound. Cultural programs, including classical music and dance performances, are also held. A few temple festivals feature massive effigies of bulls or horses instead of decorated elephants. The effigies are carried in procession to the temple from surrounding villages. Such festivals include the Anthimahakalankavu Vela at Chelakkara in Thrissur district and Aryankavu Pooram at Shoranur in Palakkad district. When and Where are the Festivals Held? The festivals happen at temples throughout Kerala, in South India. However, the larger temple festivals predominantly take place in the Thrissur and Palakkad districts, in central to north Kerala, from February to May each year. Each temple festival usually runs for around 10 days, with celebrations concluding with the main procession on the last day. Some festivals are longer or shorter. Kerala Tourism has a handy event calendar showing the dates of forthcoming temple festivals. Read more about the best time to visit Kerala. Which are the Most Important Festivals? Here are details of the top temple festivals to attend in Kerala to witness the biggest spectacles. Uthralikkavu Pooram (February) -- The eight-day festival at rather isolated Rudhira Mahakali Kavu temple, in Thrissur district's Vadakkancherry, is dedicated to Goddess Kali and has a picturesque setting bordered by paddy fields. There are day and night elephant processions, folk art and traditional musical ensembles. Three villages compete for the grandest displays. Pariyanampetta Pooram (February) -- The seven-day festival at Pariyanampetta Bhagavathy temple in Kattukulam, in Palakkad district, is known for its Kalamezhuthu Pattu ritual. Images of the goddesses are drawn on the ground with natural colored powder, and are accompanied by devotional singing. Many traditional art forms are also on display, and there's an impressive procession (with elephants) on the last day. Machad (Machattu) Mamangam (February) -- The five-day festival at Machattu Thiruvanikavu temple in Vadakkancherry features a parade of adorned horse effigies on the final day. 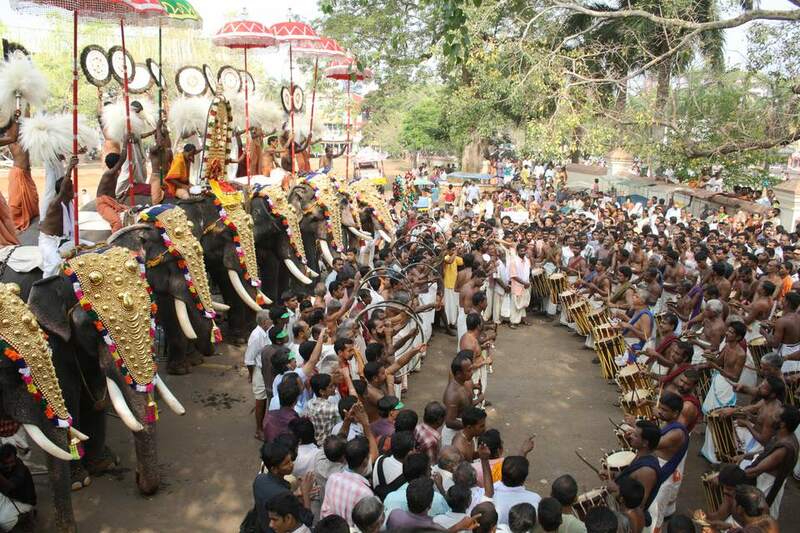 Parippally Gajamela (March) -- This important elephant pageant is held at Kodimoottil Bhagavathy temple at Parippally, in Kerala's Kollam district. It has up to 50 caparisoned pachyderms. There are also cultural programs. Chinakkathoor Pooram (March) -- A rural temple festival at Chinakkathoor Bhagavathy temple in Palappuram, in Palakkad district. It has about 30 elephants, traditional percussion, processions of bull and horse effigies, and shadow puppetry. Arattupuzha Pooram (March or early April) -- Possibly Kerala's oldest pooram festival, held at Sastha temple in Arattupuzha, not far from Thrissur. Deities from about 20 temples in the area are carried on elephants to the temple as part of the festival. Peruvanam Pooram (March or early April) -- Another ancient and legendary festival takes place at Peruvanam temple, in Cherpu in Thrissur district. There's a spectacular procession with elephants, and a four-hour traditional Kerala percussion ensemble followed by fireworks. Nenmara Vallangi Vela (April) -- The state's most significant vela festival involves two neighboring villages competing with each other for the best pomp and show. It features displays of various traditional art forms, processions with elephants, and orchestra performances. The festival is held at Nellikulangara temple in Palakkad district. Thrissur Pooram (late April or May) -- Kerala's most famous pooram takes place at Vadakkumnathan temple in Thrissur during the Malayalam month of Medam. About 70 elephants are involved in its ceremonies, plus a percussion ensemble with about 250 musicians. A highlight is the kudamattom competition, which involves the rhythmic changing of an array of decorative umbrellas. Those who are concerned about animal welfare may want to skip attending Kerala's temple festivals, or attend one of the few that don't have elephants. Unfortunately, the temple elephants are frequently mistreated. The decorated elephants are forced walk and stand for long periods during the heat, and they find the loud environment distressing. When they're not working, the elephants are chained up and often neglected. An award-winning documentary film, Gods in Shackles, aims raise awareness about the issue and bring change to the elephants' living conditions. Encouragingly, concern over the issue is growing. One temple in Kerala, the Nalapathenneeswaram Sree Mahadeva Temple in Alleppey district, has decided to use wooden elephants instead of live ones in its celebrations.